Searching for a topic using the search field. (You can search for services, knowledge base or both by clicking on the small disclosure triangle next to the globe icon). Services are organized into categories, and sometimes sub-categories. 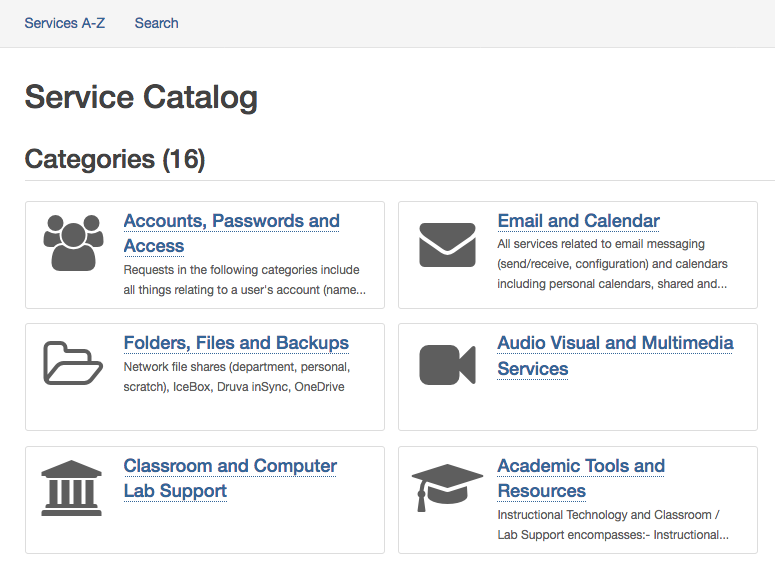 You can browse through the catalog in category view or list all services alphabetically. 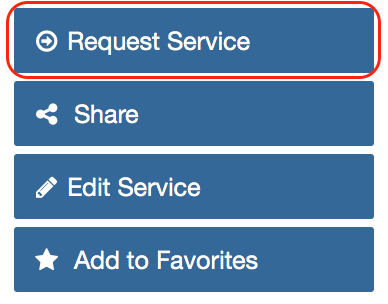 Once you locate the service you need, click the Request Service or Report Issue button in the right-hand column of the screen (some services may have a different title for the button but it will always be the top one in the list). If you are not logged in you will be prompted to do so in order to submit the request. By logging in, the system knows who you are and can add some information so you don't have to as well as track all of your requests together. You will receive an email from the system once your request has been created and you can communicate with an IT staff member who is working on your request by either replying directly to the email message, or by logging in to the Service Portal and clicking on the Ticket Requests area in the menu bar. If there is a service or a bunch of services you use all the time, you can add them to your favorites so you don't have to search for them over and over again. 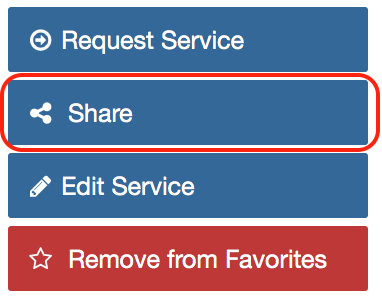 Once you've located a service you use often, click Add to Favorites to add it to your list of favorite services. To view the list of favorites, click on My Favorite from the menu bar. Your favorite services will then be listed. If you have a co-worker or colleague who may use the same request(s) that you do, you can share the service you located with them. Click on the Share button to email the service link to them. Note: You will only see the "Share" button when you're logged in to the system. 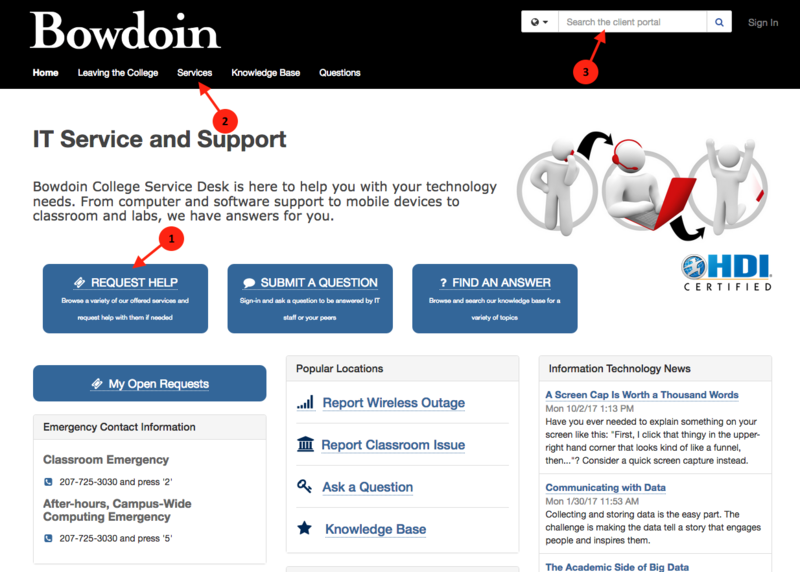 To access your open requests, click on the My Open Requests button on the home page at https://support.bowdoin.edu. If you are not logged in, you will be asked to do so when you click the button. 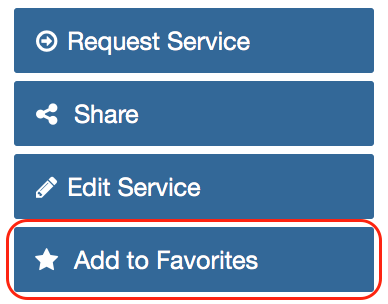 You can also access your requests by clicking on Ticket Requests in the menu bar on any Service Catalog page (when you're signed in).